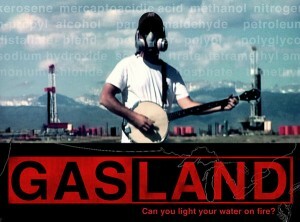 This week sees the DVD release of the brilliant home-grown protest film ‘Gasland’ through Palace Films. Nominated for a 2011 Best Documentary Oscar, the film follows filmmaker and theatre director Josh Fox as he investigates the explosion of the coal seam gas industry in the United States. Hydrolic Fracturing (or fracking) is the means by which companies extract gas from the ground and the toxic chemicals they use in the process filter into water systems and into the food chain. Some farmers on land near gas wells can light a match under their water taps and the gas leaking from their bores will instantly ignite. Other people are suffering dreadful illnesses from drinking the water and eating food irrigated with it. Fox calls the result of the rampant industry development like “a teenager’s bedroom” – all destruction, no responsibility. I hosted a Q&A with Fox when he was in Sydney to promote the film and shine a spotlight on similar problems emerging in Australia. 70% of NSW is under coal or coal gas seam exploration licenses – a tragic legacy of the Labor Party’s 16 year governance of this state. But rural communities are banding together to try to protect agricultural land and water resources from this onslaught, not only for themselves but for future generations.